Striped bass is a silvery fish that gets its name from the seven or eight dark, continuous stripes along the side of its body. On the Atlantic coast, striped bass range from St. Lawrence River, Canada to St. Johns River, Florida, although they are most prevalent from Maine to North Carolina. The east coast migratory population is composed of three major stocks - Hudson, Chesapeake, and Roanoke. The striped bass stock within Chesapeake Bay is composed of pre-migratory fish, primarily ages 10 and younger, and coastal migratory striped bass range in age from age 2 to more than age 30. Mature resident and migratory striped bass move into tidal freshwater in early spring to spawn. After spawning, migratory fish return to the coast. Most spend the summer and early fall months in middle New England near-shore waters. During the late fall and early winter, coastal striped bass migrate south to winter off the North Carolina/Virginia Capes. Maryland also has landlocked striped bass populations in Liberty, Piney Run, Triadelphia, and Rocky Gorge Reservoirs. Striped bass were stocked into Piney Run and Liberty Reservoirs in the mid 70's and early 80's to provide an additional sportfish for anglers. Piney Run, Triadelphia, and Rocky Gorge reservoirs continue to be stocked with stripers when fish are available. Striped bass inhabit coastal waters and are commonly found in bays but may enter rivers in the spring to spawn. Female striped bass can mature as early as age 4; however, it takes several years (age 8 or older) for spawning females to reach full productivity. Males can mature as early as age 2. Once a mature female deposits her eggs, they are fertilized by milt ejected from a mature male. Spawning is triggered by an increase in water temperature and generally occurs in April, May and early June in Chesapeake Bay. The fertilized eggs drift downstream with currents and eventually hatch into larvae within 2 to 3 days. The larvae begin feeding on microscopic animals during their downstream journey. After their arrival in the nursery areas, located in tidal reaches of the spawning rivers, they mature into juveniles. They usually remain in Chesapeake Bay for two to five years, and then migrate to the Atlantic Ocean. With warming water temperatures in the spring, mature fish start their spawning runs in freshwater rivers and streams to complete their life cycle. Chesapeake Bay and its tributaries are the primary spawning and nursery area for 70-90% of the Atlantic coast stocks of striped bass. Anglers encountering a tagged striped bass are asked to help management efforts by reporting the capture of tagged fish. Just call the phone number printed on the tag. MD DNR biologists continue to tag and release striped bass as part of an interstate, coastal study. Over 1,500 tagged striped bass were released for growth and mortality studies. Participate in MD DNR's continuing voluntary angler survey on the Internet, where recreational anglers can easily report their striped bass catch. This survey is designed to obtain important size data on harvested and released striped bass that is not otherwise available to the MD DNR. Striped bass (Rock Fish) is Maryland's official state fish. This is Maryland's most important commercial and recreational fish species. The Atlantic striped bass management program has enjoyed successes like no other. In a little more than 15 years, the resource has rebuilt from a historic low of about 20 million pounds to an historic high of 160 million pounds. The recreational record for Chesapeake Bay striped bass is 67 pounds, 8 ounces. The largest recorded striped bass was a 125 pound female caught on the North Carolina coast in 1891. The current Maryland Chesapeake Bay record striped bass is 67 lbs., 8 oz. The oldest ever recorded was 31 years of age. Striped bass tagged in the Bay have been recaptured in Canadian waters, over 1,000 miles away. 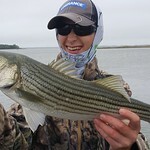 For more information on striped bass and their management, please contact Harry T. Hornick.